So, why should you be interested in what I’m trying to get done this week? Well, let me tell you. Because, we as business owners, marketing people, we have a lot to do. We have a lot of projects, we have a lot to take on. How do we get it all done? Well I’ve been spending years and years on this topic. That is how I have all this gray hair on my head. That gray hair comes from years and years of doing this stuff and I have learned from the best. It’s a continual process every single week, because I am looking at ways to get stuff done. I have too much to do and I want to get it done. Now I do actually complete things. I do get things done. But I get distracted, I procrastinate- yes even me. The world goes on around me. I do things I shouldn’t be doing, things that others should be doing, and etc., etc. and of course in a minute I am going to have to go out for a movie. Instead, I should be doing some other work. So I am going to make myself more efficient. So, this Monday, how I do it? First of all, I have in any given quarter, 3 months, in my quarters running calendar — October, November, December. That is the last quarter of the year, and I will probably have three projects, what you call major projects. These are major tasks that I want to complete. Those will be tasks that move the business forward and create money. That’s how I define it. In the old days, I would have had ten tasks. So I have paired that down to do 3 tasks in three months. I am just glad to get through them. But now I will have three which is one a month. I think if I get twelve major projects done a year, it would be good. So those are on there. Now, so I don’t forget about the other things I want to get done, I’ll probably have a waiting list. These are not on my To-Do list. This way, my list doesn’t blind me. It doesn’t make me feel overwhelmed. So I have three things. Those three things are broken down into the constituent parts. For example, I am creating a free marketing 101 course which is a free twenty day course. There’s a lot to it. So, here is how I am breaking it down and getting it done. The first task is to list out the modules. The second task is to break down the number of videos. The third task is to jot down the bullets points that will make the contempt at each one. Another task– create the images for the slides. Another one is, to record the audio for each one. And then another one. And you see these, so these become the to dos and that’s how it works. Then I go on and on and add these to my To-Do list, but I keep them on my waiting list, because if I put them in the actual to-do list, I’d get overwhelmed and feel like it was too much to accomplish. Now I will pick two of those on Monday and I will put them on my To-Do list. Now I have two things I need to get done on Monday and I’ll be happy. When I have done those two, hopefully by lunch time, then I can add something else if I want to. If I want to look at my emails, I can do that or get on with all the other things I’m not supposed to be doing. This would include checking up social media, such as Twitter to see if anyone has sent me a direct message in twitter that I missed. Either way I’ve gotten two things done. Tomorrow, I’ll do two more. And you see, so over the week, I will have done ten tasks. And I may have actually got that thing finished. There maybe a case where some of it has to be outsourced. In which case, I’ll have one of those three major projects outsourced to someone on my team. I’ll have one of the others or both the others broken up into their constituent parts. Those little parts will be on the waiting list. They will be brought on to the To-Do list. And that’s how I am working to not get overwhelmed with to dos. It works. Now if I get better and better at this, perhaps I will have three things on the list. When I work on the day, I work in batches. So I use Focus at Will as a music distraction tool. It plays classical music normally for me. Or there is another tool that I’ll mention tomorrow, in Tuesday’s Toolbox Tip. It does something else. And there are free versions of these. I will then use a timer in chrome which is free, it’s called ‘Moosti’. And it follows the Pomodoro technique. Look it up, it explains it. But I work in batches — 37 minutes work time, 5 minute break. Then I do 37 minute work time, 15 minute break. I go back and forth like that and I do that to get stuff done. And I have the music playing, so it takes out distractions. I do not look at emails, as I have turned off notifications. I silence my phone so, I am not looking at it. That’s how this works. And that works for me. Now, of course some of you may think, that’s boring. But hey, it’s up to you. If you’ve got projects that need to be done, this is how I do it. I have tried everything. Eventually by the way, I will get bored with this, and I’ll mix it up a bit and change it. But the same basic process is there. I have learned this from the experts, from fantastic people. I have learned, I have tried what they recommend and I have tweaked it and tested it to see what works for me. Now you know its Monday, because I said at the beginning, and because you look to your calendar. But also its time for our “Book for the Week”. 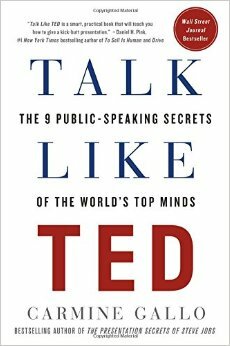 Today, I am pretty sure this guy has been on before, but it’s called “Talk like Ted”. Now this is by “Carmine Gallo”. He wrote the presentation secrets of Steve Jobs. And he analyze what Steve Jobs does. He breaks it down, to explain how everyone else can learn. Steve Jobs was hopeless at the beginning. He learned to be good on stage, presenting. So he analyzes what he does and teaches us how we can be like that. Now “Ted Talks”, if you don’t know what a Ted Talk is, just google Ted Talks. Fantastic. Unbelievable. But they are world leaders, world experts. They get eighteen minutes to deliver a talk that people will watch millions of times. Someone like, Ken Robinson who is a British teacher. His is the top watched one. These are absolutely incredible. And other people, people like Jon Rosenthal have done it. Bill Gates has done it. All sorts. Carmine, in his book, analyzes the top ones, what makes a great presentation, and then he teaches us how to do it. So if you’ve got to teach, you got to present in front of a class, or if you’ve got to present in a sales pitch to somebody, or make a YouTube video, or make a podcast, this is a great book to read. But if you want to get that book for free by the way, go to www.marketingforowners.com/freebook and there is way of getting that for free. You will get any book on that page for free, on me, at my expense, brand new from Amazon.It will be delivered anywhere in the world. Go see how to do it. You’d be surprised. See you tomorrow. 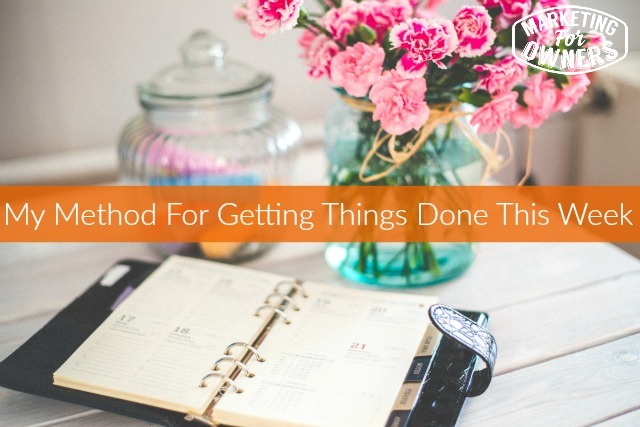 How do you get stuff done?